We’ve found an old map with a field and cowhouse called Dungeon shown on it near Thwaite but it’s not the one that the Reynoldsons showed us on the maps we had at our open day so we need to do a bit more research on that one, as well as wondering why it had that name in the first place?! Interestingly, we do know that the word ‘Ing’ which can be seen in the next door field, is from the Old Norse and means a meadow, especially one near a river. We are continuing doing the research for the Every Barn… walk leaflets and discovering some wonderful dialect field names like ‘Slapey’ meaning slippery and ‘Puke’ which is short for the family name Peacock (see Will Swales blog). There are lots of meadows called Ing and Close which are obvious, along with others like ‘Slack’ and ‘Seal’ and ‘Purse’ pronounced Puss, which we are still puzzling over. 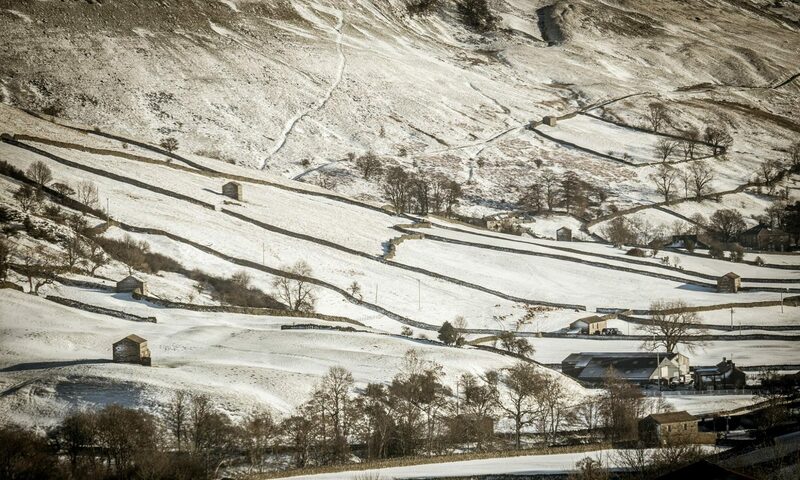 Anyone who has walked from Muker north towards Keld through the deserted settlement at Hartlakes will know how atmospheric the place is with its encroaching dark woodland and derelict houses. Many of the houses had been turned into cow’usses by the end of the nineteenth century and William Calvert remembers just how creepy those buildings could be at nightfall. Thank you to everyone who came along – a great evening was had by all and we picked up lots more useful information for the project. One of the most important things we will be producing as part of the ‘Every Barn…’ project is a set of walk leaflets helping people explore the amazing farming landscapes of upper Swaledale. We’ll be adding stories; old photographs and history to each walk making it a real journey back in time to when the cow’usses formed such an important part of the farmer’s daily life. It means we are spending a lot of time poring over old maps, zooming around digital maps and sticking labels and applying highlighter pen onto paper ones! Bringing in the hay has always been a family affair up in Muker. It was hot, dusty work though – ‘bringing out the drinkings’ was essential at regular intervals during the day. This lovely photo was brought along to our last Open Day for us to scan – we wonder what that stone jar had in it – ginger beer maybe? Have you got old photos of your family and their cowhouses we could scan for the project? Are you interested in learning about the history and features of local farm buildings? Come and have a chat over soup & a roll – we’d love to meet you! If you would like to know more about the Every Barn Tells a Story project then do drop by on Thursday March 16 2017 4.30-7.30pm at Muker Village Hall. We just taken delivery of a big box of postcards which we are rather excited about. One of the first things we discovered when we talked to local visitor businesses was that people simply don’t know what all the little buildings in the fields are. So we’ve come up with a handy postcard which they can hand out to anyone who wants to know all about cow’usses. We’ll be distributing these to visitor businesses in Muker in good time for the start of the season. Get in contact if you like some to try out. We’ll be gathering feedback over the Easter and early summer once they’ve been tried out and hope to tweak and reprint more for the main summer holidays.